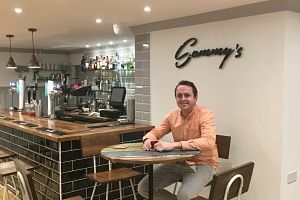 After seeking support from enterprise agency, Nwes, Sam launched Sammy’s Bar and Grill, under his Go Leisure business in East Runton in December 2016. He acquired the premises – a traditional English pub – in June 2016, and was determined to make a success of his new venture, embracing both the highs and the lows of his start-up journey. We spoke to Sam about how he turned his business dream into reality. How would you describe your start-up journey? It truly has been a roller coaster of a journey with massive highs and extreme lows. I’ve had many days when I’ve felt like throwing the towel in but, as all entrepreneurs will tell you, that is when you have to grit your teeth and kick on. After a lot of determination and drive to overcome the obstacles and challenges that came my way, my first customer walked through the door on 1st December for a pint. It made me very proud! What has been the highlight of starting your own business? The highlight of my start-up journey has been taking on a building that was in desperate need of investment, and transforming it back to life. It has also given my employees a chance to start this journey at the very beginning with me and worked together to grow with the business. What support have you gained from Nwes? I have been supported by Nwes through the Start & Grow programme. I worked with Nwes Senior Business Advisor, Sergio Aschettino to fine tune my business skills in areas, such as business planning, finance and marketing. I was also able to take advantage of free workshops offered by Nwes to meet other aspiring business owners, and develop my knowledge and understanding in bookkeeping, marketing and financial forecasting. Nwes have truly been exceptional in every way. I highly recommend anyone starting their own business to get Nwes on board straight away. I would like to have another restaurant by this time next year, and multiply to four restaurants in 2018. Then accelerate our growth as my team gets stronger. Having spent time in New Zealand, I have aspirations of taking the business across the globe, but I realise that there is much hard work to be done before I can return there. I continue to push the business dream forward with that goal on my wish list. My advice to others is – your business plan is a must. Budget and stick to it religiously – don’t over estimate income, and always be three steps ahead.